These docs are for an older version of the API. Click here for the 2.0 API. The 1.0 API is deprecated. This simple guide will help get a sample API client up and running. 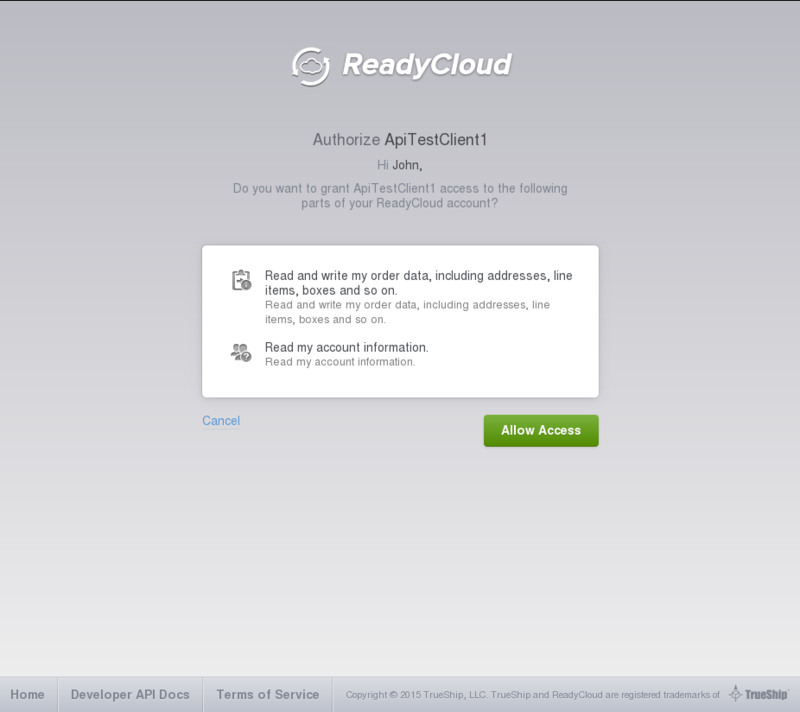 An app id is needed to authorize your application with the ReadyCloud API. Please follow the steps below in order to obtain one. Go here and create an app. Name it whatever you like, but make sure it relates to the application that you will be authorizing with. For example, if an application were named “BurgerMaker”, “BurgerMaker Client” would be a suitable name. The next step is to create a URL that your application will use to authenticate with ReadyCloud. response_type: MUST be set to “token”. This argument is required. scope: Space separated permissions to API resources that your application is requesting to access from the RC account user. If omitted, all scopes below will be requested (not recommended). You can ask for full or read only access. client_id: This is the App Id that we got from the Getting an App Id section above. This is the screen that the user who clicked the URL you created will see. If they agree to allow your application to access the parts of their account you requested and click the “Allow” button, they will be redirected to the redirect URI that you provided while creating your new app. An access_token parameter will be appended to the URL as a hash fragment, so you can process it programmatically in your application. Instruct them to copy the token into your application. At that point, your application will need to save the token in order to access the ReadyCloud APIs without needing to authenticate again. If you are writing a mobile application and you are in control of the web browser, you can automatically capture the token from the URL fragment of the default redirect URI. This way the user does not need to manually enter it. The access token in the URL above is the access_token fragment parameter. When you register your app you can optionally choose to provide a custom redirect URL. This URL would point to a page on your servers where you want customers who successfully authenticated to be sent. Since the page is on your server, and since the access token is provided as a URL fragment as described above, you can quietly capture the token without showing it to the user or asking the user to copy and paste anything. Once you have captured it you can redirect the user to a page to finalise the ReadyCloud integration or to show a custom success message. Please note that we review all custom redirect URLs for security purposes. This is just a quick check to make sure customers who have invested their trust in us and ReadyCloud are not redirected by us to some surprising location. If you do specify a custom redirect URL, your newly created app will be placed in a review queue and there will be a delay before you can proceed. Now you are ready to start giving ReadyCloud API access to your applications! Please see a small but complete Python application example here.